Kestrel employs professionals to work creatively within the criminal justice system, facilitating original pieces of work, mostly theatre and film. By empowering offenders to express themselves in a non judgmental, collaborative and enabling environment, our aim is to help them develop greater self confidence, mutual respect, and resilience. And by realising their creative potential, help them produce work of the highest standard. The original cast from Broken Dreams on the set at the Royal Court Theatre in December 2017. Read all about our story telling project at HMP Grendon. Royal Court Theatre for an experience we will never forget. Thank you so much to Rosie Pearson and the wonderful team from on form sculpture exhibition at Asthall Manor for allowing us space in the pretty 12th century church of St Nicholas to raise awareness of what Kestrel does. 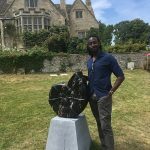 Kestrel Alumni and Ambassador Nathanial Jacobs came to read poetry and explain how the projects he did with us helped him get work behind the scenes in the film and TV and film industry and as a professional actor. Read Kestrel Graduate Nathanial Jacob’s review in Inside Times. 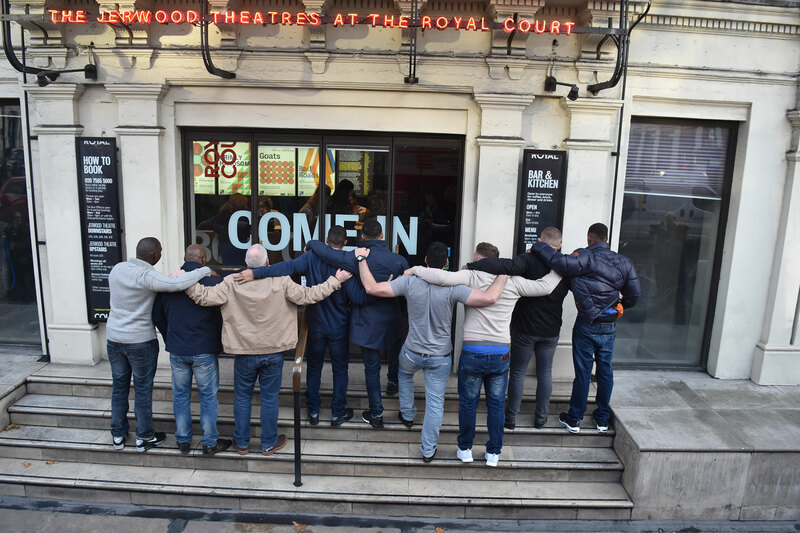 On Thursday 7th December 9 men from HMP Springhill performed their play BROKEN DREAMS – When Life Gives You a Fish on the stage of the Jerwood Theatre Upstairs at The Royal Court Theatre in London, after previewing to staff and residents at HMP Springhill on 5 December. A play about social justice and loss many of the audience were moved to tears. On Tuesday October 24th about 50 guests crammed into the Board Room at HMP Springhill for SHOULDER TO SHOULDER, a collection of performance poetry written by men from HMP Springhill on the theme of friendship over a period of 8 evening workshops. Read about it on our Blog page, and listen to some of the men performing their work here. On 8th February we held a wonderful fund raising comedy night, generously supported by Benugo, who provided the spectacular venue of The Regent’s Bar and Kitchen in Regent’s Park London, the delicious supper served by their warm and friendly staff, and many of the amazing raffle prizes. Over 160 people attended the evening of what was a great line up of young comic talent, corralled by the excellent Clive Anderson, with hilarious turns from Ivo Graham, Lolly Adefope and Liam Williams, all of whom demonstrated they are at the peak of their comedy game. We raised a little over £20,000, an amazing amount for a small charity and which will enable us to do more projects this year. So thank you to everyone who helped on the day and to all the guests who ventured out on a cold winter’s night to support Kestrel and the work it does. View the programme here.